Heat transfer in granular materials is a common occurrence in many industrial applications. One such application is the heating of recycled asphalt product (RAP). RAP is the millings from road surfaces which is composed of aggregates and bitumen coating. In the United States the percentage of RAP used in asphalt mixtures steadily increased from 15.6% in 2009 to 20.5% in 2016, representing an annual savings of more than 2 billion USD . For RAP to be reused in new road surface mixes, it must be heated and any moisture evaporated. Since the bitumen coating is flammable, a flame cannot be used to directly heat the RAP. A common method is to mix hot, uncoated (virgin) aggregate with the cold, wet RAP. In such a process, conductive heat transfer between the virgin and RAP is dominant. Simulation offers the opportunity to optimize plant design and process conditions in order to maximize RAP percentage and minimize energy input but requires accurate numerical models that capture the relevant physics, namely inter-particle conduction. There are many proposed models to describe particle-scale conduction both between particles (particle–particle) and also walls (particle–wall). Within these conduction models are several distinct modes: conduction through physical contact , conduction through surface roughness , and conduction through the stagnant gas film surrounding each particle often called particle–fluid-particle or particle– fluid–wall . For materials with low thermal conductivity, conduction through interstitial gases is the dominant mode of heat transfer. While gas film models have been well developed in literature , the applicability of these models to dense systems is suspect given that these models are derived from an isolated, binary particle collision. In this work we adopt a multi-scale approach to investigate the contribution of interstitial gases to overall heat transfer in a randomly packed bed using CFD with both the particles and fluid fully resolved in the mesh. Based on the results, we propose a new dimensionless variable which we call the proximity number. The proximity number is shown to provide a good correlation between the packing structure and the relative contribution of the fluid to the overall heat transfer. 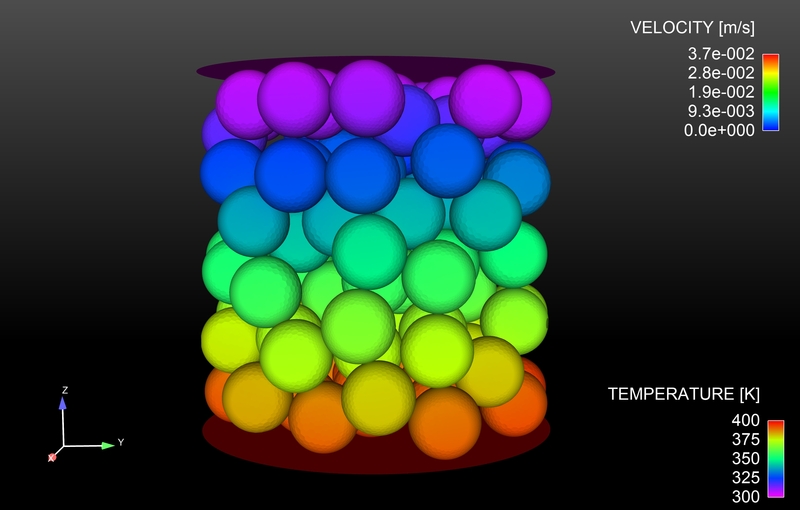 Using this variable as a means of evaluating the contribution of interstitial gas conduction provides the opportunity to include the fluid effects in a particle-based DEM calculation without the need to explicitly include the surrounding fluid, thereby reducing the computational effort required to accurately represent these systems. Conductive heat transfer through stagnant gas and solid in a random packing.